I am happy to offer some of the most unique herbal tinctures in the world. These remedies are formulated by Rosita Arvigo and made by me, Jahnan. All the herbs are sustainably harvested and picked with prayer in the heart of the Mayan Rainforest. In Belize, I trained with Ms. Arvigo in the Arvigo Maya Abdominal Massage techniques as well as Spiritual Healing Practices taught to her by the Mayan Shaman, Don Elijo Panti and Herbalist and Midwife, Hortence Robinson. Herbal Remedies offer support to cleanse, tonify, and restore balance in your body. 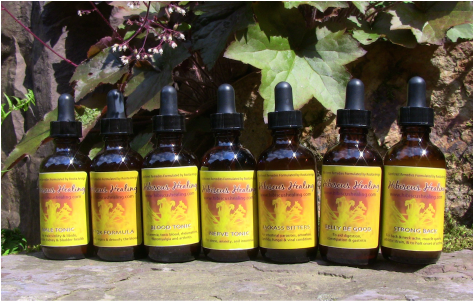 Tinctures work through your blood stream to immediately effect your condition. Each tincture is made for a specific purpose. Click on the Titles below to learn more about each tincture or to purchase them. For an overall boost in health, this tincture supports the male reproductive organs and is restorative to the kidneys and bladder. The other main reason men use this tincture is for increasing male virility. If a couple is looking to conceive a child, this herbal blend may improve the likelihood of success. It is known for its superior killing powers of intestinal parasites, amoebas, Candida, fungal and viral conditions. It's a great addition to a body detox cleanse program. Because it's an anti-viral, it fights the common cold; just use as needed. It is essential for traveling especially globally to prevent parasites by taking it daily. This blends of herbs is a powerful addition to any body cleanse program or on its own. It tonifies organs and detoxifies the blood. To be taken two or three times a day during the cleanse. This tonic can help with anemia and toxic blood. As well as rheumatism, fibromyalgia, and even arthritis. If taken directly before sleep, it reduces insomnia. Abdominal cramping, bloating or when you ate something that didn't sit right. It specifically aids in digestion, relieves constipation, and moderates gastritis and can be used as needed. For chronic conditions take 10 minutes before every meal. Also contains Man Vine, this tincture is specifically for the hard working man who endures physical labor. Eases back and neck ache, muscle spasms, and athletic strain. It can also halt the onset of asthma.